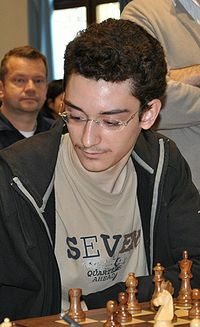 Exclusive interview by the top Italian player Fabiano Caruana for Chessdom.com regarding the coming Biel 2010 chess festival, the Chess Olympiad, the recent Mitropa Cup win, the proximity of the 2700 club, and his future tournaments. You are one of the top rated players at the coming Biel Chess Festival. What are your expectations? As you know, Biel has always been a high quality tournament. And as usual, the organizers have done an excellent job with their selection of very competitive players. So, regarding result I have no expectations, but what I do expect is that it will be a very competitive and interesting event. Who do you consider the most dangerous opponent in the event? The opponent that I consider the least dangerous would be the most dangerous. You recently appeared with rating above 2700 on the live rating list. According to FIDE.com rating card a change of +22 or more points is expected. Do you feel ready to join the 2700 club? Can Biel be the tournament that stabilizes your position there? Yes, I am the youngest on the live rating list at 2702. Nevertheless, the next youngest (approximately 2 years old than me) is Magnus Carlsen. You recently won the Mitropa Cup with Italy. What are the competitions planned after Biel? It was our first win of the Mitropa Cup since 1978. And I expect that this win will provide incentive to the other 9 participating federations to field stronger teams in the future. They are certainly capable of this. After Biel I will play the NH Rising Stars vs. Experience tournament which will take place in Amsterdam from the 12th to the 22nd of August. Towards the end of August, I had planned to play for “Linex-Magic” at the Spanish team championships, but due to a schedule conflict with the NH tournament this will not be possible. In September we have the Chess Olymipiad. You are also the head of the Italian team for the Olympiad. How do you see the chances of your country for medals? Team medals are virtually impossible at the Chess Olympiad. But just recently at the world cup of football the Italian national team found themselves on the next plane out of South Africa after losing to Slovakia. So who knows what is possible and what is not? What I do believe is that we have individual board medal possibilities – especially on the lower boards. In particular, I am expecting above average performance from our 3rd board – Danielle Vocaturo. Q: How is the ECU elections race going? this time FIDE elections are before Europeans. absolutely fair and honest campaign and final battle. why? And who is your favourite , who will receive your support ? Open support for elections has been introduced in Turin. And now both candidates use this “advantage”. I am not sure that European countries will follow the same way. In any case, Silvio Danailov’s contribution to the world of chess was enormous in the last years. I will give him my full support. somebody else on the second round for example.